A LONG-AWAITED supermarket has finally opened for business in Horfield. The Lidl store on Muller Road was opened by Bristol Mayor Marvin Rees on Thursday February 28. 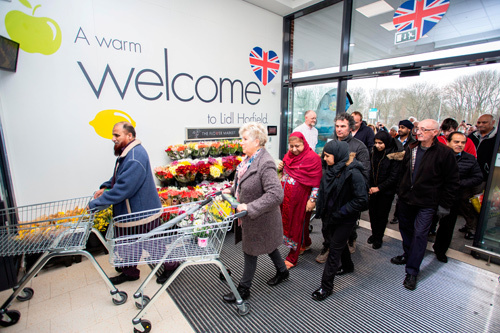 Customers were invited to attend the ribbon-cutting ceremony at 8am, and were offered the chance to sample some of Lidl’s award-winning products throughout the day, along with exclusive deals and offers on selected products for the first week of opening. As reported in Bishopston Voice, the supermarket was finally granted planning permission by Bristol City Council planning officers in May 2018. The supermarket first secured planning consent for a store in March 2016; however plans were put on hold last year when Lidl revealed that it wanted to build a larger store at the adjacent old First Bus depot site. The store has 1,325m² of sales area and has created up to 40 jobs. The supermarket features self-scanning checkouts, an in-store bakery, a customer toilet, baby changing, electric car charging points and ample parking for cars and bicycles. In addition, a new signalised pedestrian crossing has also been provided across Muller Road as part of the highway works. Commenting on the opening, Lidl UK’s regional head of property, Glen Stidever, said: “We would like to thank all those who have played a part in bringing this new Lidl store to Horfield. It is great for us to be able to create more jobs and investment opportunities in the city, and we can’t wait to start serving our multi-award winning products to the local community.